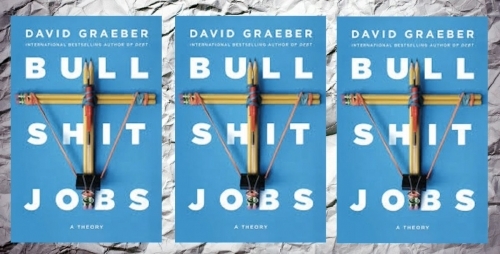 Here is a piece by David Graeber from the online Strike magazine, which even elicited a rebuttal from that venerable organ of capitalist propaganda, The Economist. The loss of meaningful, productive work is something that both Paul Goodman and Noam Chomsky have often commented on. I included pieces by Goodman and Chomsky in Volume Two of Anarchism: A Documentary History of Libertarian Ideas and by Chomsky and Graeber in Volume Three: The New Anarchism (1974-2012). Why did Keynes’ promised utopia – still being eagerly awaited in the ‘60s – never materialize? The standard line today is that he didn’t figure in the massive increase in consumerism. Given the choice between less hours and more toys and pleasures, we’ve collectively chosen the latter. This presents a nice morality tale, but even a moment’s reflection shows it can’t really be true. Yes, we have witnessed the creation of an endless variety of new jobs and industries since the ‘20s, but very few have anything to do with the production and distribution of sushi, iPhones, or fancy sneakers. If someone had designed a work regime perfectly suited to maintaining the power of finance capital, it’s hard to see how they could have done a better job. Real, productive workers are relentlessly squeezed and exploited. The remainder are divided between a terrorized stratum of the, universally reviled, unemployed and a larger stratum who are basically paid to do nothing, in positions designed to make them identify with the perspectives and sensibilities of the ruling class (managers, administrators, etc) – and particularly its financial avatars – but, at the same time, foster a simmering resentment against anyone whose work has clear and undeniable social value. Clearly, the system was never consciously designed. It emerged from almost a century of trial and error. But it is the only explanation for why, despite our technological capacities, we are not all working 3-4 hour days.